You'll be £9.95 closer to your next £10.00 credit when you purchase Dunkirk. What's this? The miracle of Dunkirk. The defeat that was a triumph. Overwhelmed by the German blitzkreig the British Expeditionary Force somehow extricated itself, less gigantic quantities of equipment and over 300,000 troops, to our island fortress to fight another day. That much is well known. But, as the author fascinatingly reveals, many myths surround the momentous days and hours when Britain's future hung in the balance. 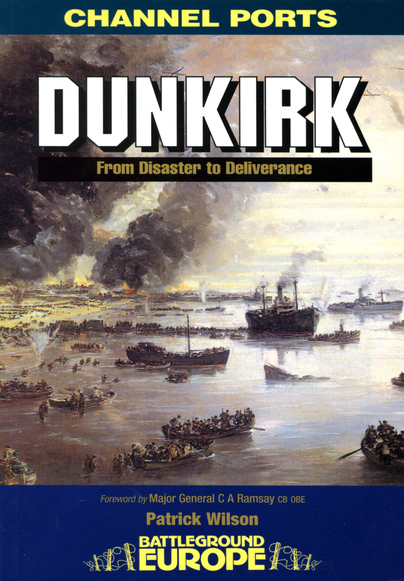 There was much more to the Dunkirk story than evacuating the beaches in the little ships and boats. The book also describes the heroic delaying actions at strongpoints such as Cassel, the tragic massacre of Wormhoult/Eschelbeck, the perimeter battles, the role of the RAF and the importance of the Dunkirk Mole, from whence the majority embarked. Patrick Wilson describes the overall strategy that was hastily adopted as well as graphically detailing individual actions. In true Battleground Europe style, this splendid little book is both an essential companion to the visitor to these thoroughly accessible battlefields as well as a rattling good read in the comfort of your home.